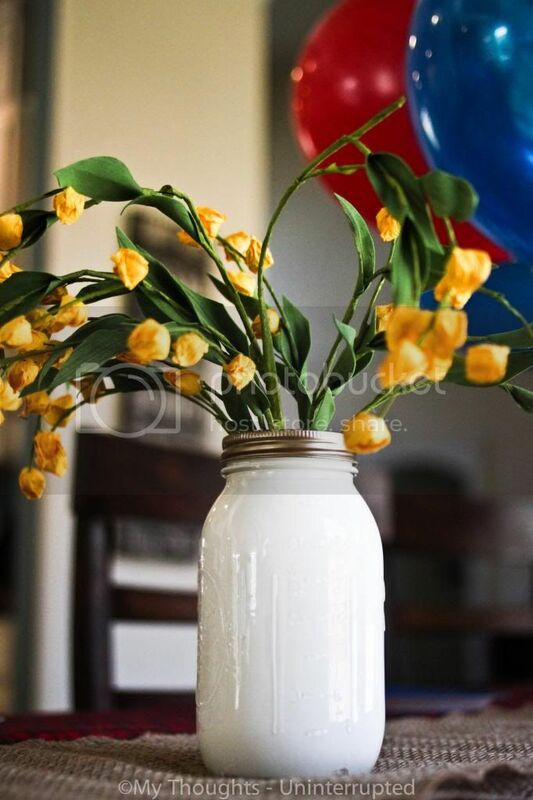 If you are like me and have joined in on the Mason jar obsession that has taken place over the last several years, you probably have a good quantity of mason jars stashed away in the closet after using them at one party or another just waiting to be used again. I've been dying to change up the decor in my house, but since I don't have a ton of extra spare cash laying around at the moment, I'm having to make do with what I've already got. 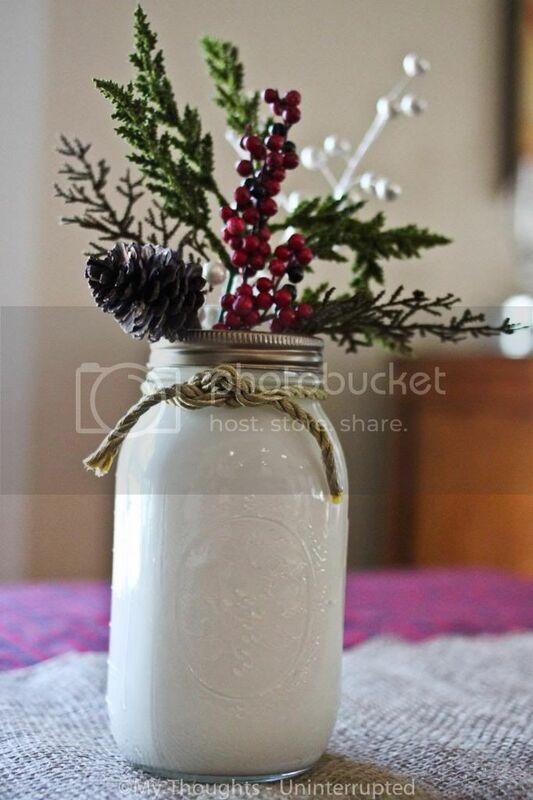 I actually painted these mason jars with intention of using them at Ethan's 3rd birthday, but they became the perfect fall (and now Christmas) decor for my kitchen table. I'm thinking about adding a burlap and lace for spring and maybe doing a group of them on my mantle. Can I confess something? I really thought this project was going to be a big fat Pinterest fail. Please tell me I'm not the only one that has those? The instructions said: Pour in paint, roll to cover jar and turn upside down to dry and drain excess paint. Um, maybe it was because I did this project outside, you know, in the elements and not inside but the majority of my paint drained off…not just the excess. Use a paint brush to paint on a thin layer of acrylic paint (I wanted an antique white so I used white with a tiny bit of yellow mixed in). Let that dry…I did turn mine over just so there wasn't any build up in the bottom. Then go back and add another thin layer. Don't get impatient…if you do too much it will pull off the "dried" paint. So, just add thin layers each time. Just keep adding layers until everything is covered properly. That is it. This method is a tiny bit more time consuming than the roll and drain method, but hey…the paint stays on and I consider that a win! So pretty, so simple - love it! They are so pretty. We have tons of mason jars leftover from several events over the past couple of years. This seems too complicated for my minimal skills, I think I'll ship mine to you and you can send them back complete - ha! 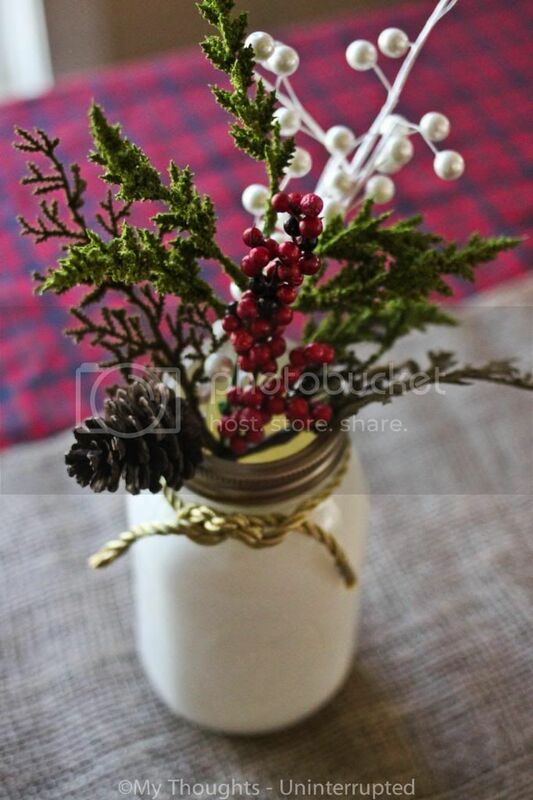 Just kidding, but they are so pretty - I really like the one with the berries and pinecone! Great project!